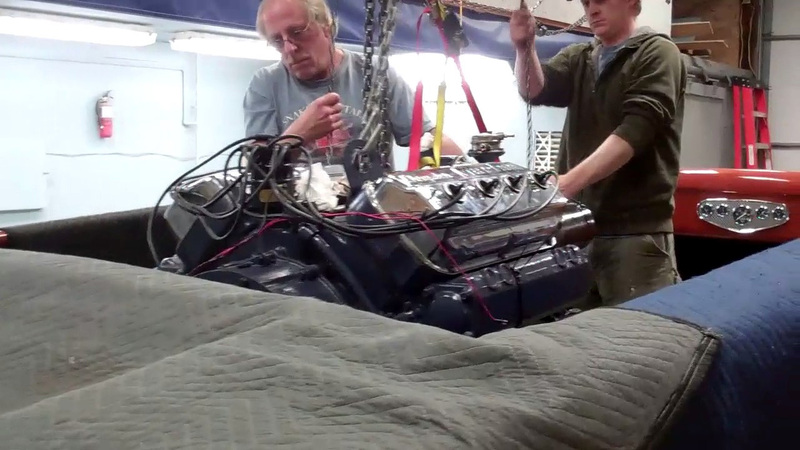 It was not without a bit of tension in the room as we raised the Hemi above Voodoo Child. That nobody was about armed with a blood pressure cuff was probably a good thing. We did, and acquired a great deal of much needed flexibility in the process. Because of the V-drive, the engine cannot be dropped through the engine bay hatch. Rather it must be set on the engine logs ahead of the engine bay bridge and then teased aft, passing under the bridge. Doing so requires that the lifting rings, which are initially fastened to two diagonally opposite corners of the intake manifold bolt holes, be repositioned several times. Keeping the engine bay bridge protected, we lifted the engine and nudged the boat forward until the lift chain was almost touching the bridge, set the engine down and released the lifting chain. With both rings attached at the aft corners of the intake bolt holes, we moved the boat further forward until the chain fall was above the hatch opening. It took several reiterations of repositioning the rings, chain and chain fall, but finally, the engine sat in place on its mounts. Next comes the tedious task of fine tuning the positioning so that the couplers on the transmission and prop shaft align perfectly. Previous PostPrevious 1953 Dual Quad Four Hemi, 331 Cu In Chrysler V8 ROARS!